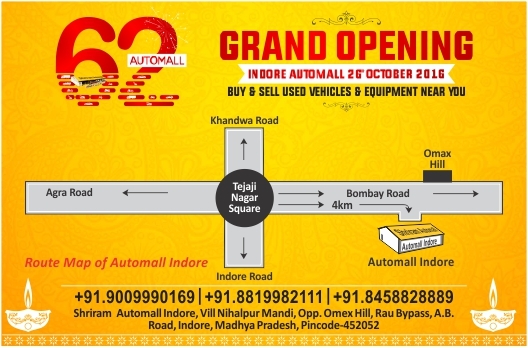 Shriram Automall India Limited (SAMIL) India’s leading service provider for exchange of used vehicles & equipment will be inaugurating its 62nd Automall in Indore, Madhya Pradesh on 28th October 2016. The Automall will be SAMIL’s 11th facility in the west zone and will aim to satisfy the demand of pre-owned vehicles and equipment through an organized medium. The Automall is located at the most prime locations of Agra Bombay road and spread over a sprawling 5.9 acres of land. People from all across Indore and nearby locations like Pithampur, Mhow & Dewas can come to the Automall and participate in our bidding events. Indore is a state that receives major demand of pre-owned vehicles and equipment and Shriram Automall through its constant efforts aims to satisfy the ever growing demand by inaugurating more Automalls in the state. Passenger vehicles and light commercial vehicles form the majority of demand and SAMIL through its agreements with leading banks and NBFCs will offer the most extensive line up of all segments including commercial vehicles, construction equipment, agricultural equipment, passenger vehicle, two wheeler and three wheelers. You are invited to be a part of the grand inauguration ceremony on 28th October 2016, 10:00 am onwards. Take part in our most exciting bidding event and buy the used vehicle you desire in the most transparent and organized manner. As a part of our expansion plan to inaugurate 75 well structured Automalls by 2020, with the launch of Indore Automall, which is the 62nd facility of the company we aim to reach the number before the target set. With favorable demand of used vehicles and equipment across the country along with a positive outlook for the coming years we are hopeful of achieving this new target easily. Our organized & transparent process has been accepted very well by the customers and we are all set to strengthen their trust through this Automall.